The Los Angeles City Council on Tuesday will decide whether to grant the Lytton Saving Bank building status as an historic cultural monument. The building is located on the lot at 8150 Sunset Blvd. where Townscape Partners is planning a project that will include 229 residential units of mostly apartments and 65,000 square feet of commercial space, with plans for a grocery store, restaurants and retail shops. The project is designed by the firm of celebrated architect Frank Gehry, the man who designed the Walt Disney Concert Hall in downtown Los Angeles. In mid-September the L.A. Cultural Heritage Commission unanimously agreed to grant the landmark status to the Lytton Savings building, designed by noted Southern California architect Kurt Meyer. Now a Chase Bank, the building, with its zig-zag folded plate roof, glass walls and interior art work, offered a radical architectural departure from a traditional bank building when it opened in 1960. 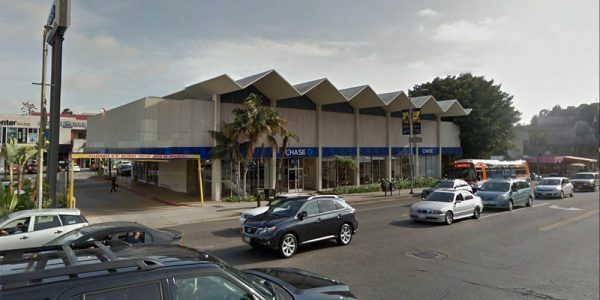 The L.A. City Council’s Planning and Land Use and Management Committee (PLUM) in October endorsed the 8150 project before considering the proposal to grant the Lytton Savings building historic-cultural status, a move considered odd by many given the impact of the project on the Lytton Building. It eventually decided not to make a decision on the Lytton building and referred it on to the City Council. The L.A. City Council meeting will take place on Tuesday at 10 a.m. at the John Ferraro Council Chamber, Room 340, Los Angeles City Hall, 200 N. Spring St. This morning, the Los Angeles City Council voted on Cultural Historic Monument Lytton Savings Bank. Just after 10am, item #23 moved up on the agenda without public comment. Bart Lytton’s daughter was on her way to City Hall to lend support, but hadn’t arrived yet (traffic). Council-member David Ryu stood and spoke to the merits of Lytton and its amazing history. He asked his fellow council members for their vote. The vote roll opened, closed and the Yes vote flashed up on the screen. Applause and thank yous erupted in the Council Chambers. It it had been West Hollywood, with the “Townscape Three” in the majority (Duran, Heilman and Horvanth), this would have never happened. A victory for the people and not greedy developers. The LACC approved the EIR which did NOT analyze the alternatives for the Lytton hence the four lawsuits against LA and Townscape. It would seem as though the agenda was manipulated so that the Lytton item would not be heard before the EIR. Not cool. The Lytton should be decided on its own merits of which there are multiple attributes. Additionally it provides a link in the architectural fabric through mid century modern era since late 1920’s which produced a wealth of landmark structures and the present with its presumable future landmarks. Lastly, it is an architects task and responsibility to be a designer AND problem solver, not a convenient eraser. Mr Gehry’s construction crane likely will be properly located in the tallest Havenhurst building which will accomplish construction logistics. The biggest and best argument of Gehry and Townscape seems to be “the Lytton Bank is inconvenient so to accommodate ourselves it should be dust”. Construction Crane Location!!! That’s BS. Has anyone seen the proposed construction plans. Gehry is not the construction engineer. But, but, but…..The LA City Council already proved a project that requires the bank to be demolished. This process of Public Hearings is backwards and ridiculous. Does 8899 Beverly Blvd Easement ring a bell?